I did it... I actually completed a granny square. I ended up resorting to youtube and watching a left-handed tutorial, and then it finally all came back to me. The funny thing is Mandrake's reaction to this whole crochet thing... he thinks I've turned into a real Nana now. He's put up with all the softies and totes without complaining... but you should have heard him last night after he saw me making a granny square! I tried to assure him that it was actually cool to be into crafts... but he didn't really believe me. Although... 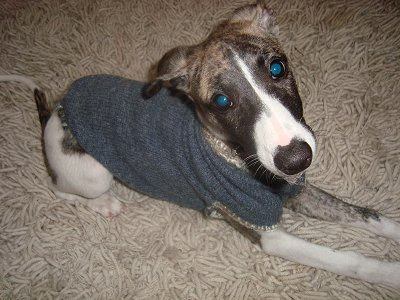 I did have to laugh when I saw his puppy in her little jumper (my mum refashioned a cardigan sleeve into a dog jumper!)... now that's what I'd call "Nana-ish" (Narnia the Nana). The squares are so cute! Learning to make these is one of the things I want to learn to do this winter. The doggie coat is so cute too! Yay ! Well done . The little girl is so cute ! yup...I am very proud of my fairly new crochet skills...and the bag makes me smile every time i see it's booble-loveliness! 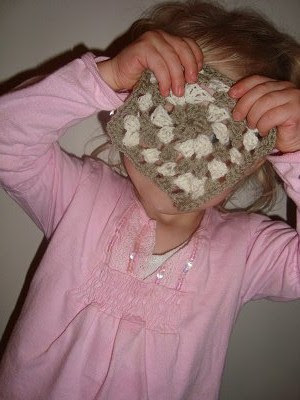 well done for the granny squares...but be careful!! you'll end up addicted like me! 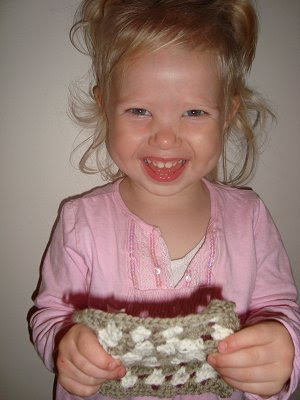 crochet is very cool, my huband says it's Nannaish too, but I love it! Beautiful Granny square!